Joining race: Renault chief executive Carlos Ghosn. Auto majors Renault SA and Nissan Motor Co. are in talks with the Tamil Nadu government for additional land for a community of vendors it wants close to its manufacturing facilities that will roll out vehicles by 2009. Tamil Nadu announced in February that it would allot 1,100 acres to the joint venture between Renault, Japan’s Nissan and India’s Mahindra & Mahindra Ltd that is setting up a Rs4,000 crore plant at Oragadam, outside Chennai, to make 400,000 cars in the first phase of its operations. Das said discussions over a negotiated price settlement with land owners had delayed the acquisition of land but it has now got possession of around 1,000 acres which will be handed over to the joint venture this month. The car company is stepping on the gas to get its project off the mark as scheduled in mid 2009. “We are struggling to meet the deadline just now and hope to get possession of the land soon so we can start work on the new plant," Renault India managing director Sylvain Bilaine said. “We are also in discussion with the state government regarding allocation of land for vendors and will facilitate the process," he added. The requisition of additional land from the joint venture could also be in line with the company’s strategy of making India one of the sourcing hubs for the Renault-Nissan combine, which procures components for its operations globally through the Renault-Nissan Purchase Organization. The French car maker, meanwhile, is likely to make its independent debut in the Indian market with a compact commercial vehicle built along the lines of its existing Kangoo van in Europe and other parts of the world. The company may also launch a compact hatchback based on its Logan platform, which will be targeted at the largest-selling small-car segment, vendors associated with the project said. Vendors who have been asked to supply parts said plans are being firmed up for the launch of the panel van, codenamed R90, which will be designed for plying on crowded Indian lanes and bylanes and will have, among other things, asymmetric doors at the back to make loading and unloading easy. While the Renault R90 is primarily a cargo carrier, it can also be designed to be a people carrier. Bilaine declined to comment on a specific query about plans for the R90 van. Earlier, he had told Mint: “We are close to finalizing our product line-up for India but I will not like to comment on this for competitive reasons." The company’s suppliers, however, insist that it is in discussion with them for these products and is close to finalizing letters of intent for various components. 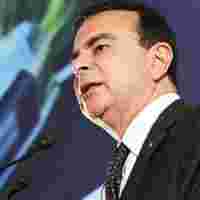 Renault chief executive Carlos Ghosn, who visited India last week, has announced that it will make a $2,500 (about Rs1 lakh) car in India with motorcycle manufacturer Bajaj Auto Ltd, which has its own plans to make a four-wheeler light commercial vehicle.